Back in the days before we knew just how unhealthy smoking is, everybody was lighting up seemingly all the time (if we can believe what we see on Mad Men, anyway). Apparently it was kind of a chore to light cigarette after cigarette all day long, so someone invented a cigarette dispenser that spat out pre-lit tobacco sticks. 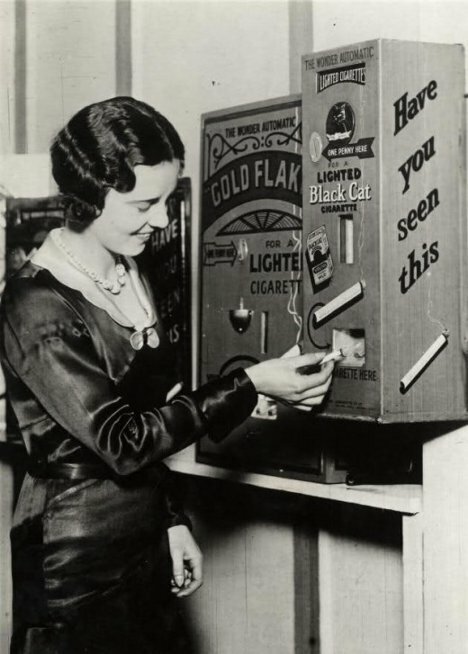 These images from 1931 show a larger commercial model and a smaller personal dispenser, both of which doled out one cigarette at a time and did away with the need for a separate lighter. Although we don’t condone smoking, we do have to admit this is a pretty cool retro gadget, and it was probably quite useful for the lady who just couldn’t find a gentleman ready with a lighter when she needed one. See more in Antique Gadgets or under Vintage & Retro. August, 2012.